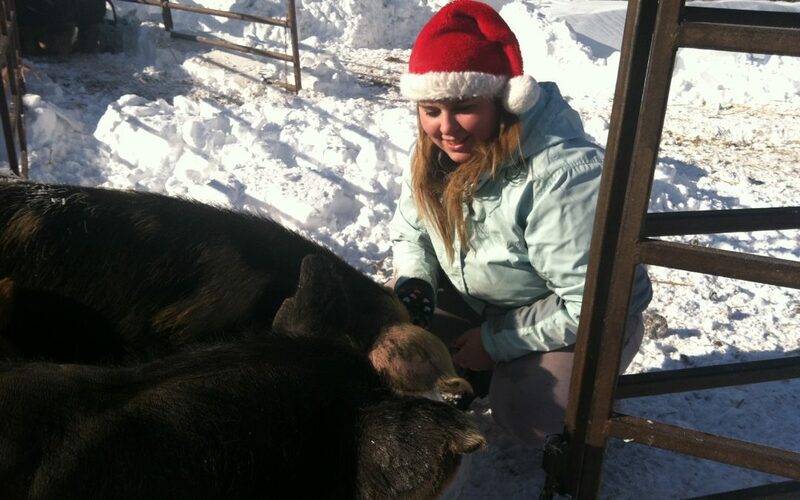 As a rancher, I have all of the responsibilities to caring for the livestock in all weather. We aren’t able to just put away the lawn mower and call it good when the snow shovel is near the door and the ice scraper is in the back seat. While I have to do those things, There’s a bit more that happens when the season changes. Without our “hay guys” there would be no feed for winter. We feed hay more months that graze some years. Then we have the “hay haulers”. These guys own the trucks and haul the hay from the fields to our livestock for feeding them. We also have the land regeneration project. The land owner has committed to taking care of the livestock while there. This is very important to the land, and the eco-impact we are trying to change. We keep our poultry and hogs at home, as they need more management than our cows do. We have a bunch of cattle at home, but they are split into groups based on their needs. More groups means more chores to do. While snow in the forecast means fun for kids, and challenging driving for a couple days. Snow can mean hours of work for me. I can spend 2-3 hours clearing the driveway, just like you. However, my driveway is about 3 city blocks long (80). While I’m out there, I go clear out the neighbor’s driveway also. They don’t have the equipment to do it. And it gives me an excuse to stop in and visit to warm up! I will then proceed to clear out the alleys to the watering troughs, and a path to each building where the animals are hanging out. If we get a lot of snow, I will make a path in the pasture so I can get to the feeding locations and give the cows a place to lay down. It can take 4-6 hours to do this part of the job if we get a bunch of snow. Sounds like fun, right? Before it snowed, Hailey and I have gone around to cover all of the fencing equipment we used over summer. We put the side vent covers in the trailer so animals travel in the comfort of no wind. We have collected all the buckets we use to feed and water animals (yes, we do a lot by hand) and stack them in the shed until the storm passes. Next we prepare for the cold that follows a snow event. The wind can be bitter, and the watering troughs can freeze over with the snow that blows in. Animals are much happier when they have water when it’s cold. They drink more when it’s very cold as they loose a lot of moisture when they exhale. Just like us! Before you go out to work in the cold, drink a big glass of water, 1-2 pints. This will do 2 things. 1. sets a timer for you of a length of time to be out before nature calls. and 2. The water gets absorbed into your bloodstream, helping your heart more easily pump blood to the feet and fingers, keeping you warmer. You may also notice less fatigue, and less dehydration from water lost in exhaling like the animals!